A private Israeli spacecraft fails in attempted Moon landing today #Moon #Israel @TeamSpaceIL « Adafruit Industries – Makers, hackers, artists, designers and engineers! Via Ars Technica: The Moon remains a harsh mistress. Earlier today, SpaceIL’s lunar lander attempted to make a soft landing on the surface of the Moon, but it apparently crashed instead into the gray world. Although a postmortem analysis has not yet been completed, telemetry from the spacecraft indicated a failure of the spacecraft’s main engine about 10km above the Moon. Thereafter, it appears to have struck the Moon at a velocity of around 130 meters per second. The SpaceIL spacecraft was launched from Cape Canaveral, Florida, aboard a SPACEX Falcon 9 rocket, on February 22. The world was monitoring the landing on a live feed and the team’s Twitter handle @TeamSpaceIL. 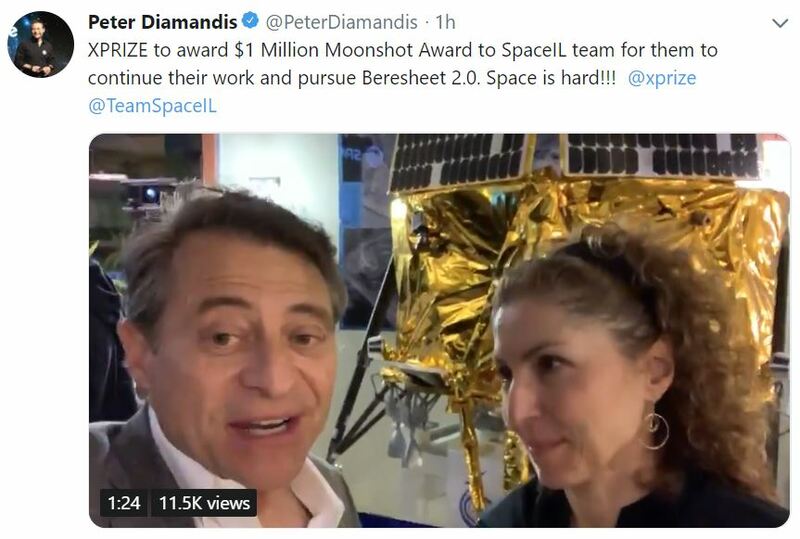 Not long after the news, the XPRIZE group announces donating a second $1 million for the SpaceIL team to pursue a new attempt. The attempt makes Israel the 7th country to have a craft orbit the moon. A number of congratulatory messages were sent from groups worldwide including NASA. You can see the launch video below.